The ITB Policy, including Value Proposition, is the government’s main tool to leverage industrial benefits for defence procurement. The portfolio numbers are large and companies are meeting their obligations. More critical, however, are the tangible benefits these investments have meant for Canadians and the Canadian economy. Below are some specific examples of the Policy’s tangible benefits. Ken Kirkpatrick, CEO and President, OSI Maritime Systems, explains how the Industrial and Technological Benefits Policy has helped his business succeed and grow. James Hargrove, CEO and VP of Sales and Marketing, Analytic Systems, explains how the Industrial and Technological Benefits Policy has meant opportunities for his company. Representatives of members of the STAR Consortia at the University of British Columbia explain how the Industrial and Technological Benefits Policy facilitated their research and development partnership. Alion Canada was established in 2007 for the purpose of developing a domestic ship design capability, primarily to support the National Shipbuilding Strategy (NSS). Since then, Alion Canada’s parent company, Alion Science and Technology, has invested heavily in growing naval architecture and engineering capability in Canada, increasing the Alion workforce in Ottawa from 2 to 58 employees. Alion is now a world leader in naval design and ship systems integration and is contributing significantly to several NSS projects, including the Joint Support Ships being built by Seaspan’s Vancouver Shipyards for the Royal Canadian Navy. Through extensive knowledge transfer from its operations in the United States, Alion Canada has been able to evolve its Canadian engineering capability for domestic and export programs, while also engaging domestically with a number of supply chain participants and academic organizations. Most recently, Alion also recently announced a significant investment in the University of British Columbia’s Naval Architecture and Marine Engineering program to help support an open-water hydrodynamic test facility. Bronswerk Group has a long relationship with the Royal Canadian Navy, having supplied Heating, Ventilation, Air Conditioning and Refrigeration Solutions (HVAC-R) for the Canadian Patrol Frigates since the 1980s. By being a leading global provider of HVAC systems, Bronswerk has secured contracts under the National Shipbuilding Strategy (NSS) on both coasts, providing Seaspan and Irving Shipbuilding Inc. with marine-grade HVAC-R systems and equipment. As a result of its contracts with both shipyards, Bronswerk has subcontracted work to more than 30 Quebec-based small- and medium-sized businesses and grown its Canadian operations by 25%. Bronswerk has also entered new markets as a result of its involvement in the NSS; a number of countries have expressed interest in equipment and engineering services, including the United Kingdom, Australia, and the Netherlands. Hawboldt Industries has been an original equipment manufacturer in the marine sector for more than 100 years. It has most recently succeeded in leveraging the National Shipbuilding Strategy (NSS) to quadruple its engineering headcount to approximately 20 percent of its workforce. Seaspan’s Vancouver Shipyards has engaged Hawboldt to design and manufacture more than 25 pieces of deck equipment and related systems on all three of the Offshore Fisheries Science Vessels. Successfully evolving from an equipment supplier to now also performing a system integrator role has expanded Hawboldt’s expertise and strengthened its positioning in the global marketplace. The establishment of a long-term relationship with Seaspan has also allowed the company to invest further in skills development, training, and new product expansion. L3 MAPPS and its suppliers in Quebec have a long and productive relationship with the Royal Canadian Navy (RCN). As part of the National Shipbuilding Strategy (NSS), Irving Shipbuilding Inc. (ISI) has contracted L3 MAPPS to design and deliver the Integrated Platform Management System for the Arctic and Offshore Patrol Ships that are under construction by ISI. The relationship between L3 MAPPS, ISI, and the RCN continues to position L3 MAPPS to explore new export opportunities for its world-class product, which has already been deployed on over 250 warships in 22 different navies around the world. In order to diversify their workforce and respond to the growing need for skilled workers in their community, Irving Shipbuilding Inc. (ISI) has developed the Irving Shipbuilding Centre of Excellence with Nova Scotia Community College. The Centre of Excellence works to create an entry point for underrepresented groups to train for careers and benefit from Canada’s revitalized shipbuilding industry. By the launch of the first Arctic and Offshore Patrol Ship (AOPS) vessel in September, ISI and its partners will have offered bursaries or programs for over 100 individuals from underrepresented groups in shipbuilding, including Pathways to Shipbuilding for Indigenous Canadians, Pathways to Shipbuilding for African Nova Scotians and a partnership with Women Unlimited (for under- or unemployed women). As well, many of the graduates of these programs were offered employment at the Halifax Shipyards. Rosborough Boats, a third-generation Nova Scotia boat builder, is working directly with Irving Shipbuilding Inc. (ISI) on the Arctic and Offshore Patrol Ship project, providing 12 Rigid Hull Inflatable Boats. This work is allowing Rosborough to sustain and grow its current workforce, as well as providing new opportunities to partner with other small businesses in Nova Scotia. In 2018, Rosborough achieved a key milestone with the delivery of the first boat to the Royal Canadian Navy. This long-term, mutually beneficial partnership with ISI will help Rosborough Boats pursue export opportunities in international markets. Toolcomm, an Aboriginal-owned small business based on the Capilano First Nations Reserve in Vancouver, British Columbia, has been working on shipbuilding projects since 2011. Toolcomm was originally contracted to work on the Mid-shore Patrol Vessel as part of the Industrial and Regional Benefits Policy. Most recently, Lockheed Martin Canada’s (LMC) partners sub-contracted Toolcomm to provide Voice over Internet Protocol and High Frequency Radios for the Arctic and Offshore Patrol Ship (AOPS) project. Toolcomm’s unique know-how in developing custom hardware, firmware, software, and electro-mechanical devices, has made it a valuable asset to Irving Shipbuilding Inc., LMC, and the entire AOPS project. Vard Electro Canada, an expert in detailed electrical engineering, procurement and product integration was formed in 2016, under its parent company Vard Electro Norway, in direct response to Canada’s National Shipbuilding Strategy (NSS). Since then, the company has been awarded work on two NSS projects: the Joint Support Ships for the Royal Canadian Navy and the Offshore Oceanographic Science Vessel for the Canadian Coast Guard. In only two years, Vard Electro Canada has grown to more than 25 employees in Vancouver and Ottawa. Vard Electro Norway recently designated Vard Electro Canada as its global Electrical Engineering Design Centre of Excellence for Government Vessels. Vard Electro Canada continues to grow as it delivers on its commitments on the NSS projects, as well as pursuing additional work globally. Bluedrop is a business based in Atlantic Canada which provides advanced e-learning courseware, learning platforms and simulations. Since its inception in 1992 and re-branding in 2004 as a leader in advanced learning, Bluedrop has developed expertise in the defence and aerospace sector, providing mission critical training solutions. The company was included in the Canadian Defence Review magazine's Top 50 Defence Companies in Canada. None of Bluedrop's successes have escaped CAE, who selected Bluedrop on two of its projects: to provide aircrew training analysis and courseware development on CAE's Operational Training Systems Provider (OTSP) contract; and to provide maintenance technician training courseware on CAE's C130J Maintenance Training Program contract. Working with Bluedrop will help CAE meet its overall IRB obligations on these projects. For Bluedrop, the work with CAE has not only helped it cement its position in the aerospace and defence sector, but it has given Bluedrop the opportunity to be a key partner in providing aircrew and technical training for other military platforms in Canada. Bluedrop has leveraged this great experience and working relationship with CAE to expand its business significantly. Lockheed Martin Aeronautics Company contributed $1,000,000 to BCIT to help design and support the creation of the BCIT 3D simulation technology. This contribution helped to leverage a $500,000 contribution from Western Economic Diversification Canada and a $380,000 in-kind contribution from NGRAIN (Canada) Corporation. The Incubator will provide BCIT, the Canadian aerospace industry, and people in other areas such as healthcare, the ability to take commercial off the shelf ("COTS") systems and demonstrate how they can be used to help create full-service training/learning systems. The technology can also enable individuals to become adept problem solvers, to learn new skills, and to prepare for hands-on activities in real work environments. The contribution by Lockheed Martin helps the IRB contractor to meet its IRB commitments on the CP140 Aurora Structural Life Extension Project and gives access to new technologies to design and develop products. The Canadian recipient benefits by improving its instructional delivery and having the ability to implement its strategic plan to generate productive graduates who will help advance the state-of-practice in their professions. The Boeing Company and Canadian industry partners created a research and development consortium aimed at strengthening Canada's competitive position in the manufacturing of advanced composite materials for aerospace and other industries. The CCMRD Consortium is a virtual centre of excellence that brings together major aerospace companies and small-to-medium sized enterprises to develop and transform the latest composite material technologies into practical solutions that will enhance the global competitiveness of Canadian industry. The CCMRD will help advance the technological capabilities of Canadian industry and build stronger relationships among Canadian and international aerospace original equipment manufacturers, as well as Canadian material, equipment, component and software suppliers. The CCMRD was formed in cooperation with the Composites Innovation Centre (CIC) in Winnipeg, National Research Council Canada's Institute for Aerospace Research (NRC-IAR) in Ottawa, and The Boeing Company. Founding Canadian member companies include Bell Helicopter and Avior Integrated Products in Quebec; Comtek Advanced Structures in Ontario; Convergent Manufacturing Technologies and Profile Composites in British Columbia; and Bristol Aerospace and Cormer Group Industries Inc. in Manitoba. Since its formation in April 2010, the CCMRD has added two new members to the consortium, Barrday Inc. in Ontario and PCM Molds & Patterns in Quebec. The consortium already has completed one project, has two projects in progress, and is preparing to launch three additional projects. In addition to financial support, Boeing is providing technical expertise and project guidance through its central research, technology and innovation organisation, Boeing Research & Technology. Boeing Canada Operations Ltd. in Winnipeg is taking part in CCMRD projects along with other consortium members. Boeing's contribution to the CCMRD is helping meet Boeing's IRB obligations on the Medium-to-Heavy Lift Helicopter project. D-Wave is a B.C.-based company at the forefront of quantum computing, building systems that solve problems where data volume and complexity are overwhelming, such as software verification and validation, financial risk analysis, and medical imaging classification. Lockheed Martin Aeronautics Company (LM) has engaged with D-Wave in two ways. First, LM established an IRB consortium to research quantum computing. The consortium partners include Lockheed Martin, D-Wave, and several Canadian universities. Second, LM purchased D-Wave's first ever quantum computer system. That contract includes the computer system as well as the maintenance and associated professional services related to the system. These strategic business activities with D-Wave are helping LM meet its IRB obligation on the Tactical Airlift project and advancing an important area of research for LM. For D-Wave, the partnership represents an ideal opportunity to work with a world industry leader and explore how their cutting edge technology can be put to use solving industry problems. Contractors like Daimler AG and General Dynamics Land Systems-Canada (GDLS-C) both know the value of Dumur Industries, a precision metal machining and fabrication company in White City, Saskatchewan. Dumur is providing refueller and water pods for Daimler's Armoured Heavy Support Vehicle System, along with associated training. For GDLS-C, Dumur started manufacturing just a few parts for the Light Armoured Vehicle (LAV) and, over time, grew this business relationship to become a supplier of over 1100 individual machined, welded and fabricated parts for the LAV and STRYKER family of vehicles. Originally focussed on the commercial food industry, Dumur actively began seeking out defence opportunities through the IRB Policy and has been very successful in securing work with these IRB Contractors. Defence work now represents a substantial portion of Dumur's business. For Daimler and GDLS-C, Dumur represents a reliable, high-quality Western supplier. Daimler, and its Canadian division Mercedes-Benz Canada, delivered its G-Wagon to the Canadian Forces in 2004 and continues to provide in-service support through contracts under the Light Utility Vehicle Wheeled (LUVW) project. As part of its IRB obligation, Daimler is working with Jroberts Manufacturing Inc., a precision machining and fabrication company located in Woodbridge, Ontario. Jroberts has performed design upgrades, manufacturing and overhaul services to the LUVW vehicle's turret assembly. For Jroberts, the LUVW success reflects years of hard work, wherein Jroberts thoroughly researched Daimler and its LUVW vehicle, proactively engineered an improved turret and sold the idea to Daimler officials. Jroberts is now reaping	the benefits of increased employment and the opening of a new repair and overhaul facility operating a CARC (chemical agent resistant coating) system in Toronto. Jroberts is delivering technical solutions for military work in other areas. Mil-Aero Electronics, located in Dartmouth, Nova Scotia specializes in the manufacture and integration of high performance electrical assemblies, build-to-print electrical cables and harness assemblies, electrical control boxes and other value-added parts for the defence, aerospace, and industrial markets. Raytheon Space and Airborne Systems has contracted Mil-Aero for the production of Radio Frequency cable assemblies. Mil-Aero's success with this work has positioned the company to participate in future opportunities, not only with Raytheon but with other leading international aerospace and defence manufacturers. This relationship was developed because of Raytheon’s Industrial and Regional Benefits (IRB) obligations to Canada as a result of the CF-18 Defensive Electronic Warfare Suites project. For Mil-Aero it has provided the opportunity to integrate into the supply chain of a world leader in the industry, and to demonstrate the quality of their products and services to other global contractors. Pratt & Whitney US supported the development of the new Pratt & Whitney Canada Mirabel Aerospace Centre (MAC) for the assembly and test of new engines. The MAC will be responsible for the assembly of the PW800 engine for the next generation of business class jets and the PurePower® PW150G engines for the Bombardier CSeries. The MAC will also feature an engine flight test facility that will house two 747 aircraft that have been retro fitted to conduct flight tests. The test facility will be a global flight test centre for all of Pratt & Whitney's next generation of engines. The Mirabel Aerospace Centre is a leading, state of the art 300,000-square-foot facility for Pratt & Whitney Canada, a United Technologies Company. It represents a $360 million investment and will employ approximately 300 people within the next five years. The facility is located at the Montreal-Mirabel Airport in Mirabel, Quebec. The development of this facility is a part of Pratt & Whitney IRB obligation on the purchase of 18 engines for Canada's fleet of C-17 transport aircraft. This IRB activity will generate approximately $108 million in IRB activity, which does not include investments from the Quebec government. 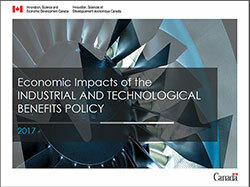 This project is an example how the IRB Policy can help ensure high technology work comes to Canada. ProNautic is based in British Columbia and specializes in the manufacturing, servicing and installation of custom ship interiors. The company has played a significant role in the marine industry for more than two decades. ProNautic was selected in 2010 by Irving Shipbuilding to design and manufacture the interior fittings, joiners, linings, ceilings and doors for the nine Mid-Shore Patrol Vessels (MSPV) which Irving is building for the Canadian Coast Guard. For Irving, this partnership with ProNautic will help it meet its requirements on the MSPV project and demonstrates their commitment to providing regional opportunities. For ProNautic, its participation on the MSPV project supports the company’s corporate strategy to further its growth in the niche defence marine market. The work has supported plant utilization and preserved advanced-technology employment at this modern production facility. QRA Corp is an emerging developer of systems and requirements engineering technology based in Halifax, Nova Scotia. QRA’s technology and capabilities have been used by engineering teams around the world to avoid costly reworks, enable confident engineering, and find previously undetected catastrophic design flaws. These projects bring QRA closer to achieving their vision: freeing innovation and innovators from excessive cost and delays associated with increased systems complexity. QRA now has a presence within the global value chain of a large aerospace and defence multinational company and has a clear demonstration of the quality of their systems engineering tools. Rheinmetall Canada operates a large facility in St-Jean-sur-Richelieu, Quebec, where it manufactures and services a variety of advanced weapon and defence systems. The IRB Policy has been an important factor in the company's success and growth over the years. First, the Quebec facility (originally owned by Oerlikon Contraves) was established as an IRB activity itself, as part of the Air Defence Anti-Tank System (ADATS) project won by Oerlikon in 1986. Over the years, the company developed a strong knowledge of the Canadian procurement process and requirements, in part through performing long-term in-service support on the ADATS. Oerlikon Contraves was sold to the Rheinmetall Group in 1999. Since then, the Rheinmetall Group has won several military contracts with the Canadian government, including the Halifax Class Modernization Shield Replacement, Close Area Suppression Weapon and the Repair and Overhaul of the 42 Leopard 2 A4 Training Tanks. In each case, Rheinmetall Canada successfully leveraged the IRB Policy as part of its business case to secure technology transfer and major parts of the work share from its parent companies. This work has helped diversify its product base, promote long-term job and financial stability and position Rheinmetall Canada for future growth. The business and IRB relationship between General Dynamics Land Systems-Canada (GDLS-C) and Rutter Inc., of St. John's, Newfoundland and Labrador, is a long and positive one. Rutter is a provider of repair, in service support, design and manufacturing services for complex military assemblies. Beginning in the late 1980's, GDLS-C included Rutter as part of its IRB program on the Bison Light Armoured Vehicle project with a contract to purchase 199 panel assemblies for vehicles to be procured by Canada. Extending from that original commitment, Rutter has since provided assemblies for all GDLS-C's export markets, including Australia, New Zealand, the United States and other foreign military sales programs, as well as continuing to participate on subsequent Canadian acquisitions of Light Armoured Vehicles. The success behind the relationship shared by Rutter and GDLS-C is a reflection of commitment from both companies and captures the goals and spirit of the IRB Policy. Rutter's success and sustained competitiveness in its work with GDLS-C has allowed it to grow and mature as a contract manufacturer to the defence industry and position itself for similar work with other global manufacturers. GDLS-C's commitment to in-country supplier development has facilitated the growth of Rutter as a strong regional supplier. Thales is developing its next generation, Advanced Phased Array Radar (APAR) system and is pursuing global sales. As part of its participation in and IRB obligation on the Halifax Class Modernization project (with prime Lockheed Martin Canada), Thales selected Sanmina (formerly Breconridge Corporation) to undertake high complexity redesign, development and manufacturing of key microwave modules for its APAR sale to the Royal Danish Navy. This high-quality APAR work will increase Sanmina's revenues by over $50 million over 9 years and help maintain and create many highly skilled engineering and manufacturing jobs at the company. It will also help solidify Sanmina's presence in the defence market and build a strategic foundation for future work, not only with Thales but with other defence contractors requiring broad electronics capabilities. SIIT is a post-secondary and trades training institution in Saskatchewan, in operation since 1973. As a key part of its programming, SIIT began developing in 2006 an Aircraft Maintenance Engineering (AME) Program and the Saskatchewan Aviation Learning Center, to serve both the pressing needs identified by the aviation industry and to increase the success of First Nation students seeking to enter the aviation trades. The AME program and the Saskatchewan Aviation Learning Center opened its doors as an Approved Training Organization under Transport Canada in 2010. This project was assisted with the support of federal and provincial governments, the airport authority and major defence contractors such as Lockheed Martin, Boeing and Rockwell Collins. These major defence contractors all have IRB obligations to Canada related to their various military contracts. SIIT actively sought out opportunities through the IRB framework and successfully leveraged IRB contributions from these defence contractors, helping to obtain the equipment, training and curriculum required to successfully certify, launch and operate the AME. Today, SIIT's AME is a model of industry-academic partnership. It has a current enrolment of 19 students in years one and two of the program. The first graduates will exit in Spring 2012 and all have secured employment in the local aviation industry. Students require 48 months of both classroom and industry training prior to challenging the AME licensing exams. With the AME Program success, SIIT has established strong working relationships with defence contractors and will continue to propose training and business opportunities to them within the IRB framework. The Boeing Company, as part of its IRB activities on the Strategic Airlift Project, is donating funding over a five-year period to a joint project between the University of British Columbia (UBC) and Simon Fraser University (SFU) to evaluate and improve visual analytic processes for interpreting complex data. The goal of the project is to develop new processes for using 2D and 3D visual analytical models and statistical data to improve the maintainability and reliability of new aerospace products. The investment will help the university consortium become a leader in applied visual analytics. The project includes the development of an applied visual analytics curriculum. Project results will be published, presented and shared in workshops. Along with the cash donation, the universities benefit from the expertise of Boeing engineering staff and in-house internship opportunities. The relationship among Boeing, UBC and SFU is proving successful, already resulting in significant research, published work and internship opportunities and more on the near horizon. IBM is a member of the Lockheed Martin Canada team delivering the Halifax Class Modernization project, providing its Multi-Link product to upgrade Canada's fleet of frigates. One of IBM's indirect IRB activities involves the contribution of a hardware and software solution delivered to the University of Toronto, to build and support the high performance supercomputer which forms the basis of the SciNet project. Valued at $28.5 million, IBM's in-kind contribution has been combined with that of other funding partners in a broader research consortium, which includes support from the federal and provincial governments as well as the University of Toronto and affiliated research hospitals. Together, the SciNet project is enabling research into areas such as biomedical sciences, climate research and aerospace engineering, at a scale not previously possible in Canada.